You may think of chili as greasy and unhealthy but that just isn't true. Most of today's chili recipes are packed with nutrients that are good for you and chili can be part of a healthy diet and lifestyle. The next time you need a reason to make chili, just come back here and read these reasons again. 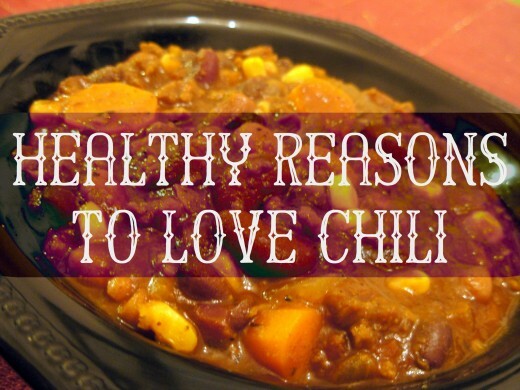 Because yes, eating chili can be healthy for you. So why not go find your favorite recipe and make a big pot of homemade chili as soon as you can? The meat in your chili is an excellent source of protein and if you make your chili with beans, you have a great second source of it too. Even if you make vegetarian chili with beans, it can be a great source of protein. You need fiber in your diet and the chilies, peppers, and beans in this dish are excellent sources of it. Fiber not only works to help keep you regular but it also slows the rate at which sugar is absorbed into your body. If you're a diabetic, this will be really good for you because it keeps your blood glucose level from rising and falling too quickly. The peppers—even bell peppers—that go into chili are an excellent source of vitamin C and we all know that vitamin C is really good for your body. The tomatoes and tomato paste that you use are also an excellent source of vitamin C. Vitamin C helps to improve your body's immune system and can work to help keep you healthy. The iron in the beans in your chili is really good for you. A lot of people don't get enough iron in their daily diet. I bet you didn't know this, but a big bowl of chili can help you lose weight. Yes, you read that right. The capsicum found in the chilies and the peppers used to season your chili will raise your body's metabolic rate thereby raising heat production. Even sweet red peppers can do this. So what are you waiting for, go grab another bowl of that delicious homemade chili. I bet you didn't know that chili can make you happy, did you? Chilies can cause your body's endorphin and serotonin levels to go up, sometimes significantly. The capsicum is the trigger. This can make your mood better, making you feel better all around. The capsicum in the peppers and chilies can also help to lower your cravings for fatty and sweet foods. So go ahead! Tonight, make that big pot of chili and have a bowl or two. The chilies and peppers are filled with vitamin A and vitamin C, which can help boost the immune system. Vitamin A is really good for you during the cold and flu season. Chili can help to regulate your body's blood sugar after you eat it since chili peppers can lower your body's sugar levels and the amount of insulin your body needs. The capsicum in chilies increases mucous production, which can help to clear congestion. So the next time you feel a cold coming on, make a big pot of chili and enjoy several bowls because guess what? Chili and the ingredients in it are healthy for you.